Naomi Hirahara with the crew from Pasadena-based Prospect Park Books. From left: Colleen Dunn Bates, publisher and founding partner; Hirahara; Patty O’Sullivan, associate publisher and partner; Jennifer Bastien, marketing associate. 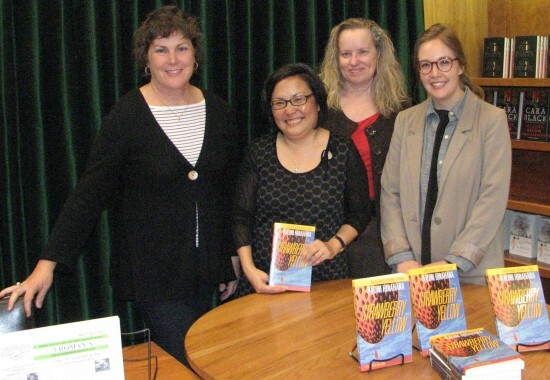 PASADENA — Naomi Hirahara chatted about the inspiration for her mysteries during an appearance on March 7 at Vroman’s Bookstore in Pasadena. Like Hirahara’s late father, Isamu, Mas is a Kibei — a Nisei educated in Japan — who survived the atomic bombing of Hiroshima and became a gardener in Southern California. The new novel takes Mas to his birthplace, the “strawberry capital of the world,” where Hirahara’s father was born. After the war, Mas returned to Watsonville to start over, finding shelter with cousins and working in the strawberry fields. Decades later, Mas goes to Watsonville once again to attend the funeral of his cousin Shug, a major strawberry grower, and ends up investigating a murder that is connected to a new blight-resistant strawberry varietal. Hirahara remembers visiting relatives on a farm in Watsonville as a child, and also did research for a biography of Nisei philanthropist Manabi Hirasaki, who began farming strawberries in Monterey County after the internment. To celebrate the launch of the new novel, she brought fresh strawberries from the South Pasadena Farmer’s Market. Fans line up for the book-signing. 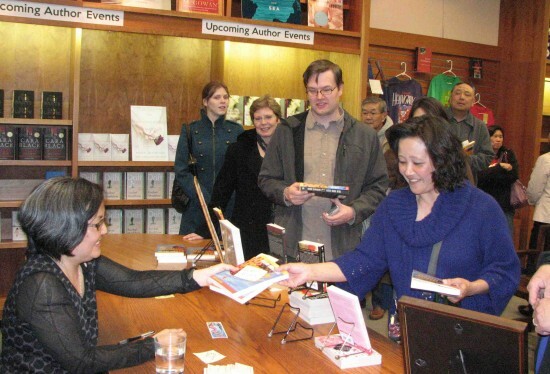 She was joined at Vroman’s by her new publisher, Pasadena-based Prospect Park Books, her mother, and some old friends, including Martie Quan Kawahara, her former Rafu Shimpo co-worker. One thing that sets this latest adventure apart from the other books is that Hirahara tells the story not only from Mas’ viewpoint but also from that of one of his enemies, Jabami. Yes, that’s a Japanese name. “Don’t get to know me too much, because I’ll probably steal from you,” she joked, noting that the details of a friend’s car accident found their way into one of the novels. One relative who is not of Japanese ancestry learned about the words from her Japanese American father-in-law. “That’s part of the book experience for me too, that people will start talking with other people,” Hirahara said. Hirahara recently visited the Tohoku area, which was devastated by the 2011 tsunami, as a volunteer doing relief work. “It was just incredible for us to witness it … more than a year later … the destruction, people in temporary housing,” she said. Naomi Hirahara will speak on Saturday, March 30, at 2 p.m. at the Japanese American National Museum, 100 N. Central Ave. in Little Tokyo. “Strawberry Yellow” is available for purchase at the Museum Store. For more information, call (213) 625-0414 or visit www.janm.org. Visit the author’s website at www.naomihirahara.com. 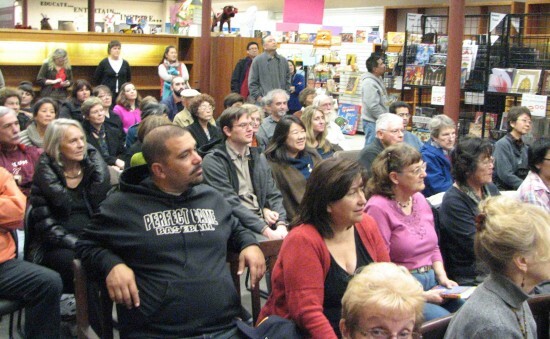 The reading at Vroman’s drew a full house.